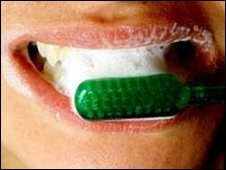 One in three adults in the UK do not brush their teeth for the recommended full two minutes per day, experts believe. Experts stressed good brushing is essential to prevent tooth decay. Chief Executive of the Foundation, Dr Nigel Carter said: "Your dentist can remove any build-up of plaque and tartar on your teeth, but everyday care is vital and is down to the individual. "Your toothbrush is one of the best weapons against gum disease." He said many studies over the years had shown that the average time we brush our teeth for is only around 45 seconds, less than half of that necessary to do a good job. "Yet our study shows people think they are doing considerably better than this," he said. "Gum disease is the largest cause of tooth loss in adults, and poor oral health is being linked to more and more serious illnesses such as strokes and diabetes, but it is a preventable condition, and a good oral health routine at home is key to preventing it." Experts advise people to brush their teeth for a full two minutes twice a day, with fluoride toothpaste to keep the mouth clean and healthy.